There are many essential oils that can help home smell like the Holidays; all while offering health and wellness benefits. We have created a list of 10 of the most popular Christmas essential oils to get you started. You can use them in your diffuser to spread the Christmas cheer! We have come up with a top 10 list of the best essential oils for the Holidays. Cinnamon essential oil is earthy, spicy, and woodsy reminding us of baking, Christmas acorns and Christmas wreaths. Health Benefits: boosts brain activity, removes blood impurities, improves circulation, pain reliever, anti-inflammatory, anti-bacterial and anti-septic. There are many more benefits to cinnamon oil, but we have limited it to only a few. Ginger is great Holiday oil. Ginger comes across as warm and spicing. Try blending with orange oil. Health Benefits: Motion sickness, nausea, stomach problems, indigestion and respiratory problems. Cedarwood oil is another spicy scent that offers many health benefits. It is extracted through steam distillation from the wooden pieced of the Cedar Wood tree. Be sure to always use pure essential oils. Health Benefits: De-stressor, anti-septic, anti-inflammatory, acne, arthritis, aphrodisiac and kidney disorders, to name a few. Orange oil is one of the most versatile essential oils available. It is also quite inexpensive, making it a popular oil. Health Benefits: Cheering, uplifting, anti-inflammatory, anti-depressant and an aphrodisiac. You can’t go wrong with Vanilla. Almost everyone loves the scent. 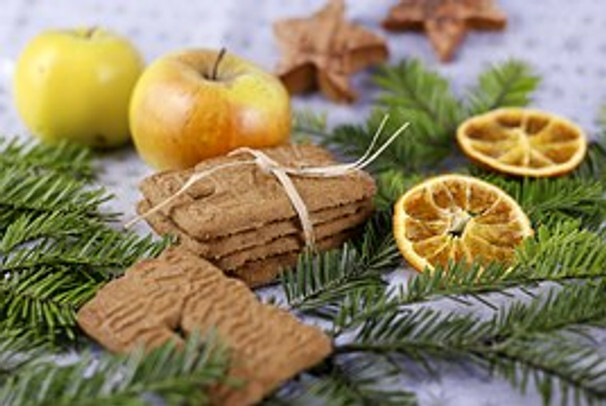 Blends well with Cinnamon or Orange giving off the scent of freshly baked cookies. Health Benefits: Relaxing, anti-depressant and anti-oxidant. Definitely a Holiday scent; spicy and rich. Try blending with orange oil. Allspice is extracted from its leaves and fruits. Health Benefits: anti-viral, aphrodisiac, pain reliever, relieves headaches, colds and sinus problems. Also provides indigestion relief. Such a great scent. Mix it with citrus oils or other spicy oils. Health Benefits: Helps with fatigue and insomnia. Also great for energizing and uplifting yourself. Also neutralizes the effects of chemotherapy. Helps to reduce nausea and stomach problems. A warm, rich essential oil. Make sure to purchase the pure oil so that you can benefit from its wonderful health benefits as well as its beautiful aroma. Health Benefits: boosts concentration, helps with insomnia, de-stressor, pain reliever, soothes indigestion and detoxifies the body. This is one of the most popular oils out there, and for good reason. It is extremely versatile. A beautiful blend of earthy and fruity. A very warming scent. Health Benefits: Calming, relaxing, great to use with Yoga and Meditation. Frankincense oil is grounding, calming, and relaxing. Also a great anti-inflammatory. Not everyone puts up a “real” tree. Not to worry. Spruce oil will make your home smell like you’ve got a real tree up. Health Benefits: De-stresser, anti-depressant. Always use with a carrier oil, if you are applying topically. Really? Did you think we would forget this awesome scent? We had to sneak it in to make a top 11. Everyone loves peppermint! Historically, the peppermint herb was used mainly for medicinal reasons. Although today, you find it in many baked goods and candies. Health Benefits: Stimulating, aphrodisiac, helps with indigestion and nausea. Have questions? Please visit us at www.serenityaroma.ca or email us at: serenityaromawellness@gmail.com.